It is extremely important to make sure you choose the right groomer for your cat. Make the wrong choice and your cat could be traumatised for the future. This makes a new groomers job 100 times harder. Dog groomers are not specialised in grooming cats, especially when grooming nervous cats which is why they are called dog groomers :-). Handling and grooming nervous cats requires a totally different set of skills. 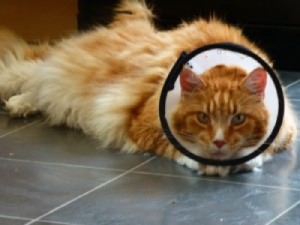 I have seen, time and time again, behaviour problems due to a cat who has been traumatised through-out their time at the hands of a dog groomer who is inexperienced at handling cats. Not saying it happens all the time, as there are some excellent cat and dog groomers out here, BUT when it goes wrong it can cause long term behaviour issues. Imagine a cat taken to a grooming parlour that has dogs on the premises. It would be able to smell and hear dogs and, if the cat was kept until the owner was able to collect, it would need to be placed in a cage where the dogs may be in eyes sight. Even if a cat was placed in a cage in another room it would still hear dogs barking until the time its owner came for collection. Tender considerate handling is required especially when it comes to grooming nervous cats or ones aggressive due to fear. Cats like this require a quiet environment, their owners present through-out and plenty of breaks and reassurance. Handling cats on their own territory is best. No car journey, no unfamiliar territory. Sometimes I am faced with a cat who is aggressive, nervous and fearful. I always know why without the owner even telling me how the cat was groomed in the past. It is very clear to me that something has gone badly wrong. Many groomers will act in a forceful manner to get what they want done because the owner has paid them. This is not how I work. My philosophy is to work with the cat and to gain trust. If a cat does not like a particular way of being held then I do not hold it that way. I will try a different technique. I have groomed hundreds of cats of all temperaments and do not believe a groomer should use any form of restraints or face muzzles. If you are worried about your cat because it doesn’t tolerate being handled well then please don’t hesitate to email info@catnips.co.uk and we can discuss booking a home visit appointment.